The 10 Best Spots for Wings in Oregon! Chicken wing lovers rejoice! Oregon is home to some of the best traditional style and unique wings in America. Try wings with sauce so hot it has “dynamite” in its name or a smokier wing that you won’t be able to get enough of. Here are the 10 best places to get wings in the state. As its name implies, Portland's Fire on the Mountain is the perfect place to go for wings for those who like it hot. They're considered by many to have the best wings in the city. Because it's also a brewery, you can count on having plenty of cold beer on hand to help wash down the wings. Always fresh, never frozen, the wings at Rock N Wingz in Hillsboro are also made from free-range chickens! Delicious sauces range from a mild, brown sugar-based teriyaki to one so hot it's called “Kissin Dynamite” and everything in between. Eugene staple Hot Mama's Wings features 15 handcrafted wing sauces and always uses chicken that's free of antibiotics and hormones. A regular winner in the annual “Best of Eugene” competition, Hot Mamas also offers open mic nights in keeping with their commitment to fostering neighborhood involvement. 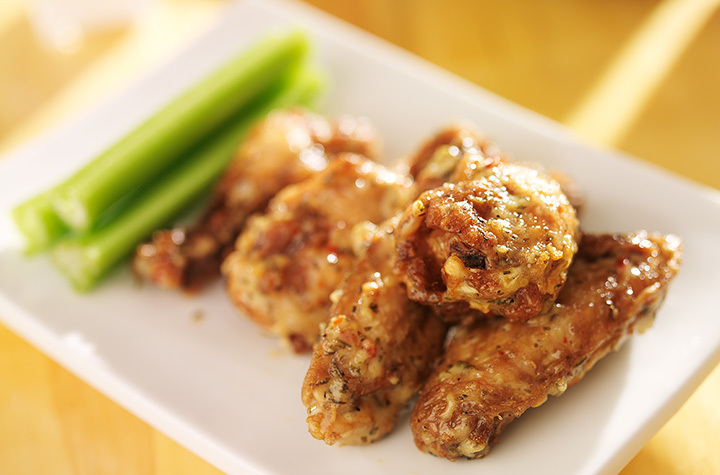 If you're gluten-free, you'll love the wings at Toxic—they're finished in rice and bran oil. Try those smoked wings tossed in Carolina barbecue sauce for a sublime taste experience. Having a special event at your home or business? Ask them about having it catered by their food cart. Consistently voted the best chicken wings in the area, Chicken Bonz bills itself as "chicken with attitude"—and that attitude is delicious. You can get them super hot or extra mild depending on your personal preferences. Try the honey wings if you like them on the sweet side. This family-friendly sports pub knows that a sports bar is only as good as its grub—and the wings are fabulous. With 12 big screen TVs, you'll be able to enjoy the sport of your choice while enjoying your wings. Mama Chow's kitchen offers Portland residents the best in traditional Chinese street food. Try the honey-soy-garlic glazed wings served on a bed of yummy jasmine rice. Most people wouldn't consider a hardware store a destination for wings, but at Cannon Beach Hardware and Public House, you can do your hardware shopping and relax with a great plate of wings in the same location. You can get them Cajun style, hot and spicy, barbecue, or salt-and-pepper. Newport's Flip'n Chick'n serves up some of the best wings on the Oregon coast. You can also get homemade tamales here. Thai-style chicken wings keep Portlanders coming back for more at Pok Pok. Don't miss their Vietnamese fish sauce wings with pickled carrots on the side.